The first signing to Chvrches’ Goodbye Records is the talented, 17-year-old, Irish songwriter, SOAK (real name Bridie Monds-Watson). SOAK’s new single, Blud (watch the video below), has already gone Top 10 on Hype Machine, been named Zane Lowe’s ‘Next Hype’, and picked up by the likes of Huw Stephens and Phil & Alice at Radio 1. Blud is set for release on 16 March, and in the interim, Chvrches have shared their remix of the track. Immediately, Chvrches put their trademark stamp on the track by seamlessly transforming the bare-bones, acoustic-driven original into a dark, synth-driven, electro-pop tune. Or, put another way: Chvrches’ remix sees SOAK morph into Ladyhawke. Equally as impressive is the way the remix manages to recolour the vocals from the fragility of the original into something more commanding and confident. 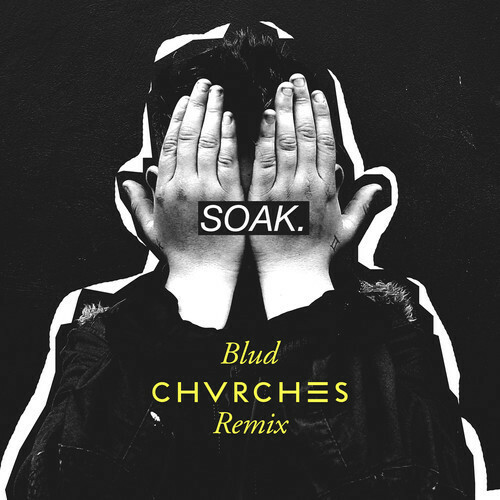 The old adage that a well written song is one that can be played in any number of genres rings true here, thus Chvrches tasteful remix can also been seen as a testament to SOAK’s songwriting. Monds-Watson has spent the last two years splitting time between her studies, the local skate-park, and her songwriting. There was significant acclaim for 2012’s 3-track EP, Sea Creatures, which saw her offered slots at Glastonbury and Other Voices, support Tegan & Sara on tour, and complete a Biology GCSE moments after playing the City of Culture launch for Derry. On Blud, however, SOAK accelerates her ascent from raw talent into a unique artistic voice. More atmospheric and textured than her earlier work, the track is as inspired by a childhood of Joni Mitchell albums as the brooding productions of Cat Power. SOAK also played every instrument (except for bass) on Blud herself, while the track was produced in Donegal by Mercury-nominated Villagers’ guitarist Tommy McLaughlin. Blud will be released on 17 March, 2014.